I am still looking for a pattern for my special mustard wool fabric--purchased two years ago now!--and decided to give New Look 6067 a try. The triple front darts add visual interest, and the slit neckline is a different look for me. I like it in the dress at left (it was on Piperlime but no longer available; I have no idea who made it or how much it cost). Thanks to sewisewedthis, I now know this is the Milly Mariella Windowpane Tweed Pencil Premium Work Dress, $187. I did my usual litany of adjustments (broad back, small bust, etc. ), including swayback adjustment. 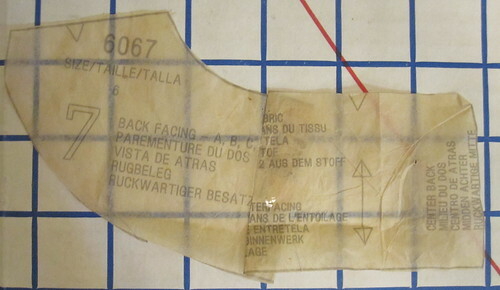 For dresses with a seam at natural waist, I split the swayback adjustment between the bodice and the skirt, as you can see. Unfortunately, I should also have shaped the center back seam and taken just a little more length out. Scroll up to the composite and you can see the swayback problem. Ick. I'll have to wear it with a belt every time. 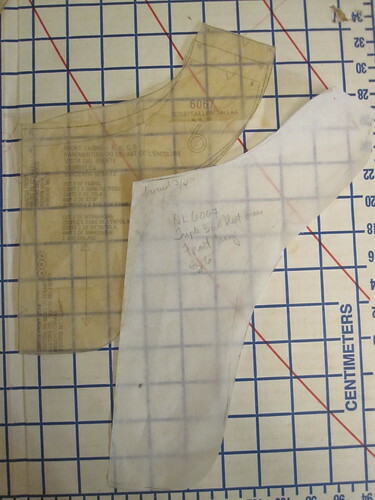 Since this was somewhat of a wearable muslin, I considered making the front bodice as drafted, but in the end I just couldn't see that ending well at the bust, so I took small tucks out of each of the three darts for a small bust adjustment. The dress fits well across the bust, with comfortable ease but not Empty Sack Syndrome. The way the dress is meant to be finished is actually quite nice. 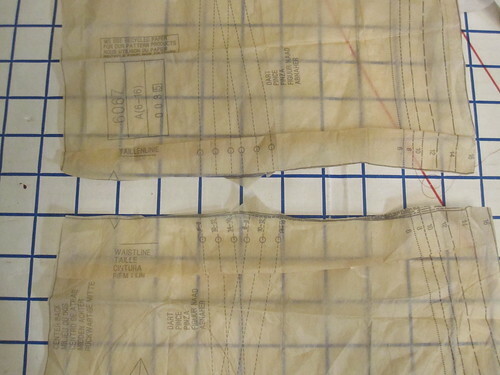 There is a separate front lining piece drafted with a normal waistline dart and facings. You are meant to stitch the facings to the lining (the facing needs to be fashion fabric because it will show a bit at the front neckline). This is a cool cotton summer dress and I didn't need an extra layer, so I just did facings. To ensure plenty of facing coverage and avoid flipping and flapping, I lengthened and widened the front facing, as you can see at right. As I suspected when cutting, the back neckline gaped a bit so I added 1 inch wide darts and modified the back facing pattern to suit. 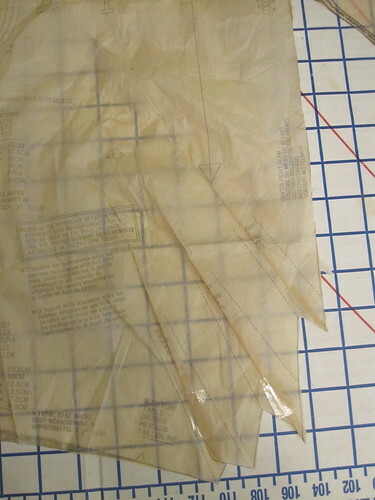 I used the Sunny Gal technique for a neat-finished facing of sewing the interfacing and the facing right sides together along the outer edges, then flipping and fusing the interfacing. The saggy neckline on my Simplicity 2177 fresh on my mind, I interfaced the fashion fabric of the front neckline in addition to the facing. A nun might find the front neckline as drafted just a tad prim, so I lowered the front neckline by 3/4 inch and lowered the slit opening by two full inches. To get the slit to show, I gradually increased the seam allowance as I got closer to the neckline, adding 1/4 inch in total to each side (for a 1/2" opening). I might go in and take out even more, as the slit still doesn't show very well in wearing and it just looks like a very high-necked dress. I ended up cutting the skirt a bit short and therefore had only a 1/2" hem allowance to work with. Hem lace to the rescue! It's sewn with a machine blind stitch. I used maroon thread in the bobbin to coordinate with the lace and brown thread in the top thread to coordinate with the fabric so everything would look nice. I lengthened the back slit for bike riding and it is very easy to bike in. I originally cut the skirt a little wider in an A line, but I mocked it up along the stitch lines for the drafted tulip shape, and with the slit I had plenty of leg movement. I added side seam pockets, but side seam pockets are not a great match with a tulip-shaped skirt. I may have to just hand-stitch them closed as they gape a bit. Not enough to notice they're pockets, but just enough to make my hips look even wider. 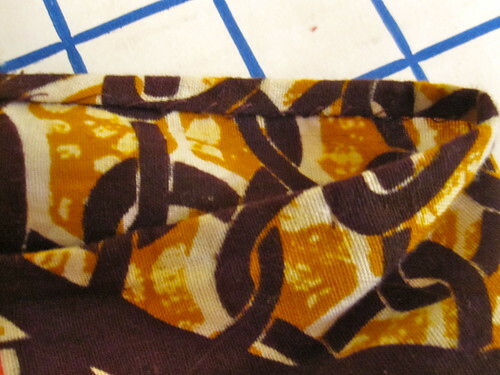 I am very pleased with the way the print placement worked out for this fabric, one of the African prints my friend brought me back from Liberia. The only things I did in my cutting layout were to make sure I wouldn't have a floral bullseye over my bust and to minimize how much the baby poop light brown color was near my face (it's so close to mustard, but it's just not). The way the print flows so well from the bodice to skirt and the left and right front bodice is just a lucky coincidence! OH, I just LOVE this—what an amazing print, and you did a great job with the placement. A nun would find the neckline prim... lol! It's gorgeous. I love the African print, and I agree- the placement is perfect. I really like that neckline. The slit is different. Beautiful! I really love this dress. A really great use of a beautiful graphic print! What a fun print! 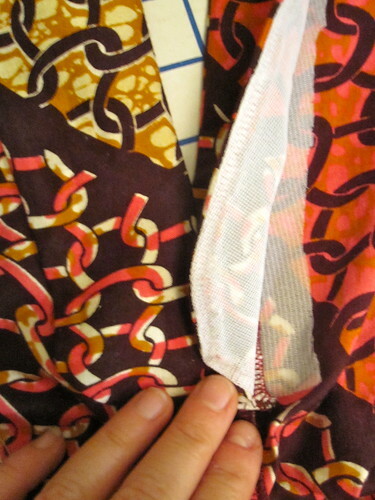 I like the finishing on the sleeves and hem, and that's a great tip for finishing the facing. Awesome dress! I actually said "OOh!" out loud when I opened your blog. This dress is a real triumph on you - color, pattern, shaping. All so flattering! At least in the photos the pattern really hides the swayback issues. 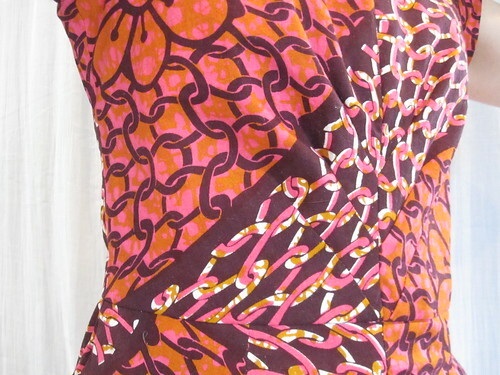 I love the shape of your dress and the print is so fun!!! I really love this dress on you. And such an awesome print fabric! I'm always too scared to use prints like this because I'm not very good at visualizing the end placements. What a distinctive dress. The print is awesome. I love it! Amazing fabric and placement! Great fit too! Love the pattern placement, really impressive. The bodice and neckline are quite attractive on you--not prim at all I think--but rather streamlined. I could never get away with it myself, so I'm a bit jealous! What a cool dress - excellent use of the print! The colors look good with your hair. Fantastic Job! The print is gorgeous, and as always it looks wonderful on you!! I love all your creations. This dress looks great, and the pattern works really well with the pleats in the front. I was wondering if you would take a close up shot of the finished neck with your added darts in the back? Neck gaping at back is a problem I consistently have and would love to see your solution up close!! Wow wow wow!!!! This dress is just gobsmackingly beautiful!!! You really knocked it out of the park on this one. The fit is dead on. The print is perfect and your use of it even more so. LOVE THIS DRESS!!! This pattern is among my recent purchases so I am very glad to see it made up. I like it! as you mention the details would show more in a solid but I like the fit and shape on you. I think it would make a nice winter dress in the long sleeve version. This is SO cute and flattering on you - love it! The placement of that print is divine! And the nun comment made me snort out loud. I really love your dress, though I totally understand being super picky about finding a perfect pattern for your special fabric. Still, this dress is great, I am sure you will get a lot of good use from it. This turned out really well. I LOVE IT! What a great dress! 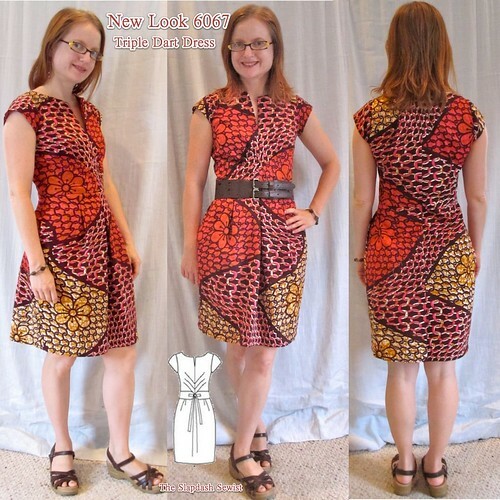 This review is very helpful to me, as this pattern is very near the top of my to-sew list. One of my all-time faves of yours. Very flattering! I brought home some fabric from Botswana and have never used it. You've inspired me! After looking at this (and, admittedly, not reading the description), I realized that I have tried to make this pattern and it came out horrible! Now I'm going to have to study what you did because you and I have a very similar figure and you made it work! You did a great job with fabric placement. Even though this is not the right pattern for your special fabric, it did give you a very pretty dress. That is one fantastic dress! It looks like it should be way to bold and busy, but it's just fantastic on you. Very pretty! What a fabulous print. It is now official - I am the only person on the planet that this dress doesn't suit. Every version I've seen online looks great on every person who's sewn it, but it doesn't look good on me. Well, this looks great on you. I love the print of the fabric. I've had this pattern since it came out, but have been afraid to tackle the sba. Thank you for posting this!! It's very flattering on you. Did you have to do a broad back adjustment on this as well? Beautiful, the pattern placement worked out so well and the dress style and colour looks fabulous on you. What a lovely fabric. I really like the bodice detail.. I love this dress. Great print and the colors are definitely yours. Fabulous dress! It looks great! Fantastic dress. It really suit you and you look fabulous in it. I love your use of the print very much! This is awesome. Add this to the list of things you made that I want an exact copy of! 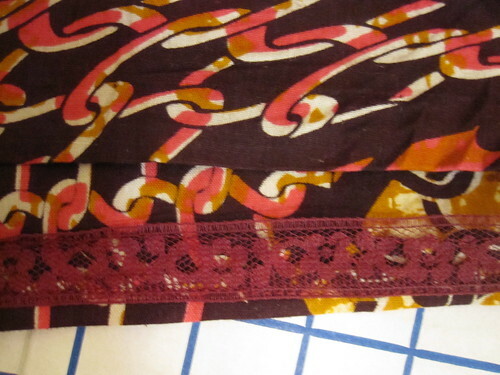 WOW, I love that print...I have some African fabric one of my friends sent me from Ghana. This is absolutely breathtaking!!! Nice job. Awesome dress! I love the colors on you. But the best is the fabric layout on this dress. Love it! I love the fabric for this, and the layout you've used works really well. Very cute! The triple pleats don't cause much poofiness, unlike others I've seen. Love this dress & fabric on you. Great job! Wow! What a fabulous print!!! Oh - on a side note! I turned one of your blog posts into an article in my ASG newsletter. I'll email you a copy when I get them ready for the printers. The pattern placement on this dress is so interesting and flattering, it looks amazing. It is a pity to lose the construction details because of the print, but the shape is so good on you. I really love this fabric. It is really perfect for this dress. This is a great looking dress on you. Gorgeous dress! Love the pattern!!! What a fabulous dress, you look awesome in it. I just love it.